Shimmer like a mermaid (from head to tail!) with our Sea-Tox Sea Mineral Shimmer Gel! 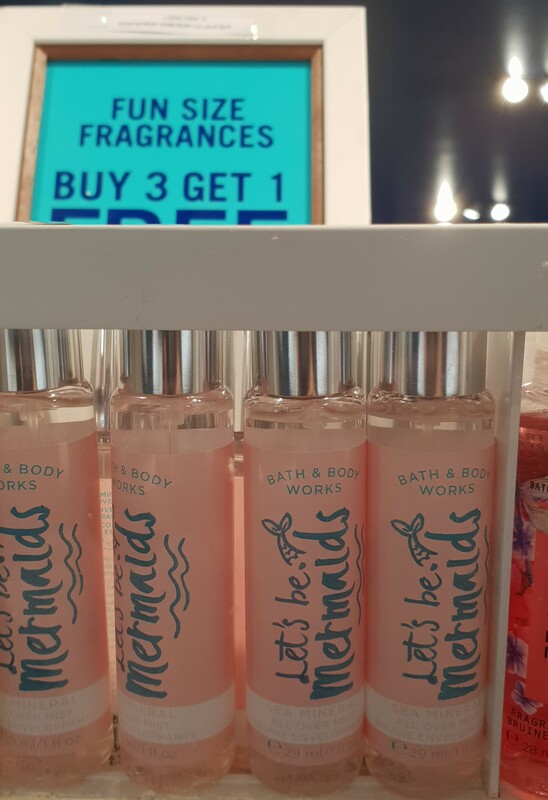 Our unique formula features sea minerals to leave your skin nourished, fragranced & oh so sparkly! Nope, I don’t do Body Glitter. Just the idea of trying to wash off every speck of glitter off my body in the shower, makes me want to curl up into a fetal position and cry. Also, even if I could keep my OCD in check, I don’t show enough skin to actually wear this stuff. Even if I did decide to dress up/down in more “exposed” clothing, where and when exactly, would it be appropriate to sport shimmery skin in Kuwait? I believe it’d be pointless to slather this stuff on before going for a swim at the pool or beach, because most of it would just wash off. The formal events are too formal for Body Glitter whereas the informal events are too casual for Body Glitter. Clubbing is a not a thing over here and we don’t have our version (or any version, really) of Coachella in Kuwait. Everyone would think I was insane if I just popped down to the nearest Starbucks on any given morning… sporting glittery shoulders. 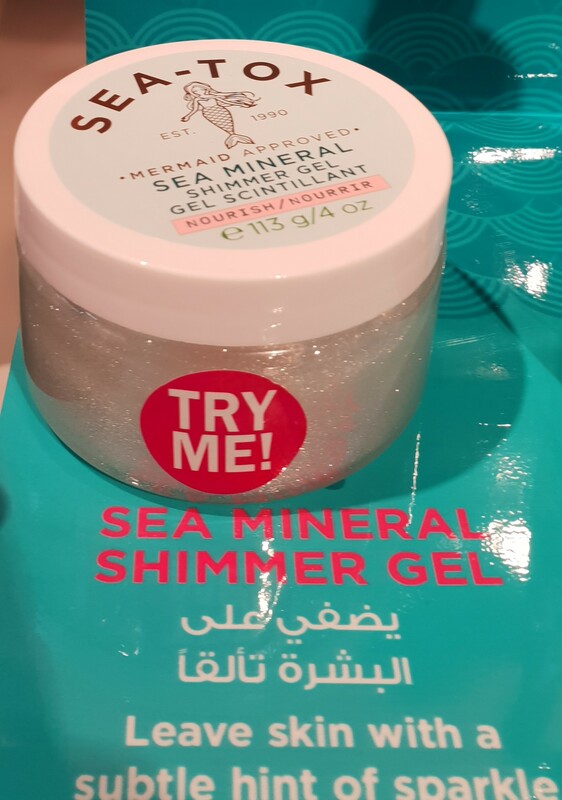 With that being said, if I was into the partying scene (which in Kuwait translates to house parties at the Spanish Villas lawl) or a tween (who tend to enjoy sparkly things in general), I’d totally be all over this Sea-Tox Mineral Shimmer Gel because this stuff is moisturizing and scented! Seeing as how I’m neither of those things, I had to pass on getting it. Wishing upon a starfish for hydrated skin? Make your mermaid dreams come true. Refresh with Sea-Tox Sea Mineral All Over Mist! Made with nourishing & conditioning sea minerals, this rejuvenating mist channels the power of seaweed to revitalize & relax you from head to tail! Directions: Spritz & apply to face & body – use daily. Mermaid Tip: Also great as a hair refresher! I’m still working my way through my Cucumber All-Over Mist from the CocoaShea Collection (previously hauled here) so I definitely didn’t need another full-size All-Over Mist and was actually more smitten with the mini version (all the way at the bottom of this post) which looked oh-so-cute! However, due to everything being on sale for KD 2/750 I decided it would be more practical to go for the full size instead. It was between the Water Collection Face & Body Mist (here) and the Sea-Tox Sea Mineral All-Over Mist for me, but I ended up going with the latter, because I couldn’t justify getting both. 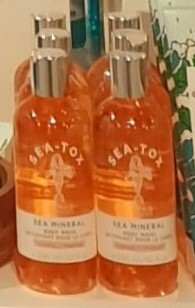 Also, as an added bonus, due to the packaging, the Sea-Tox Sea Mineral All-Over Mist can totally double as a Nautical Theme Decor Item! 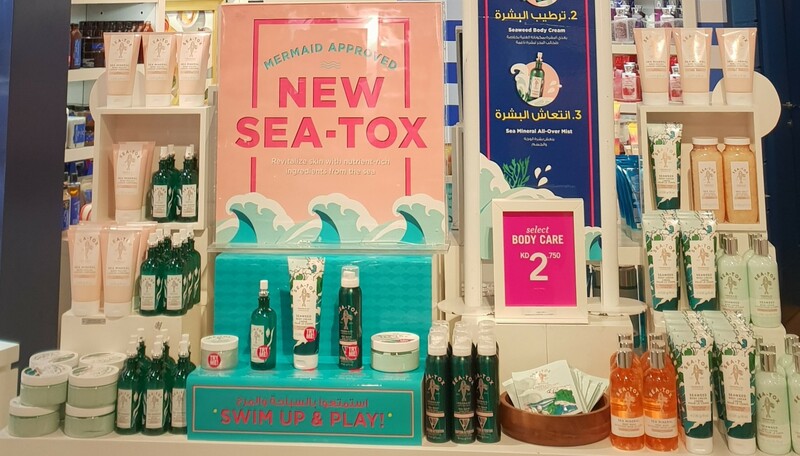 Drench your beach body in 24 hours of moisture with our mermaid-approved, nutrient-rich Sea-Tox Seaweed Body Cream! This sea-powered moisturizing body cream features nutrient-dense seaweed to calm skin & replenish moisture, leaving your body feeling sea breeze soft. Directions: Apply anytime to clean, dry skin in need of a moisture boost. Mermaid Tip: Use daily to avoid dry, scaly skin! The Wave Print on the packaging on this thing is what I was referring to when I mentioned The Great Wave of Kanagawa (here). Personally, I hate this type of packaging, because no matter where you store this stuff, the product housed inside always, always goes bad and starts to smell like play-dough. I noticed it pretty early on (2013) and unfortunately many years later, the same issue still remains (2017). It’s not just Bath & Body Works though, because I’ve noticed the same problem with my beloved Cream Silk Conditioner (here) which utilizes the same packaging. I realized that whether you opened them up and attempted to start using them up as fast as possible or kept them unopened and stored in a dark and cool place, they’d still go bad pretty quickly, regardless. That said, even though I absolutely hate this this particular type of packaging, I just had to purchase this stuff based on the Wave Print alone (logic)! It’s such a shame about the packaging though, because out of all the different versions of Moisturizers at Bath & Body Works, this particular type is the most superior, by far (no greasiness, fast absorption, best texture, best results)! In fact, I was so impressed by this stuff that I even picked up the mini version. So far, this stuff smells amaaaaaze! Get that just-spent-the-day-at-the-beach hair with Sea-Tox Wave Hair Foam! Our texturizing formula features sea salt to form gorgeous waves in your hair. It’s the sea change your standard beauty routine’s been searching for! Directions: Apply to damp hair, scrunch & style to your hair’s content! 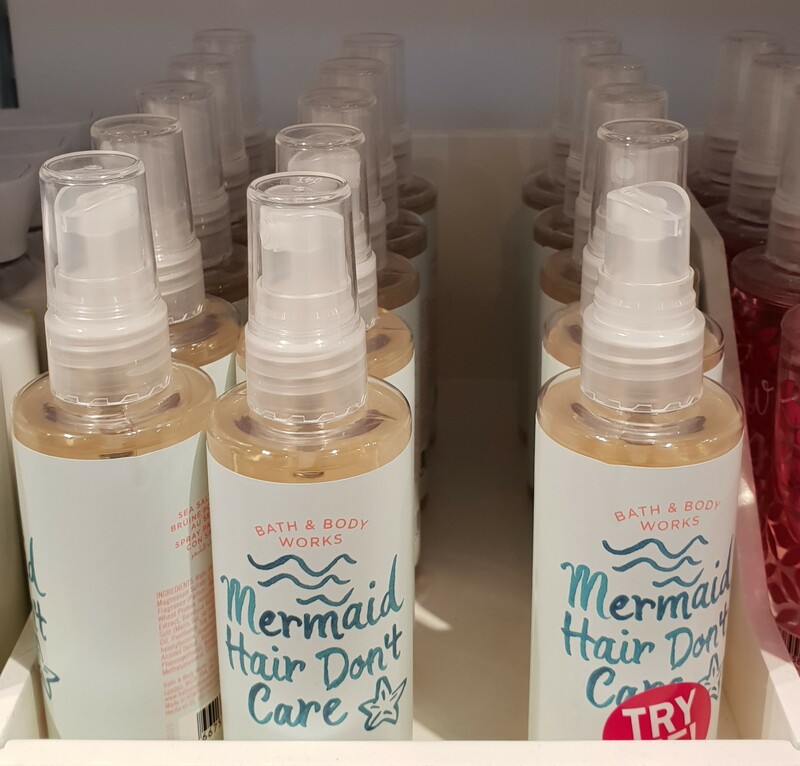 Mermaid Tip: Beach hair, don’t care — use daily! I was so excited when I saw this! Some of the Bath & Body Works products are hit or miss, but for me personally their Hair Care stuff is always a win! I’ve only used this stuff once so far, but I’m already obsessed! At first, I was a bit surprised because based on the name, I was expecting some sort of foam to come out of the bottle. Instead, I got a very bubble-y and liquid-y mess (the kind you usually get just as you’re about to run out of the product or when you don’t shake the bottle properly beforehand). So I shook the bottle for a bit and tried again. Still the same result (I was starting to believe that I’d accidentally picked up an almost empty tester). I shook the container for a minute or so until I was fully satisfied that everything housed inside had successfully merged together. Still the same result. That’s when I realized that this “foam” was actually more of a liquid-y gel. I applied a generous amount to my hair and let it air-dry into “wet-look” curls and even when my friend and I had dinner at one of those restaurants facing the fountain (by the Opera House) on a particularly humid day, not once did my hair frizz up! As an added bonus, every time I’d turn my head, making my newly short hair swing, I’d get a whiff of the delightful Sea-Tox scent (see description at the beginning of the post for “fragrance notes”)! I’m pretty sure you can use this stuff for a slicked back “wet-look” do or any other “wet-look” too! Such a fun product! 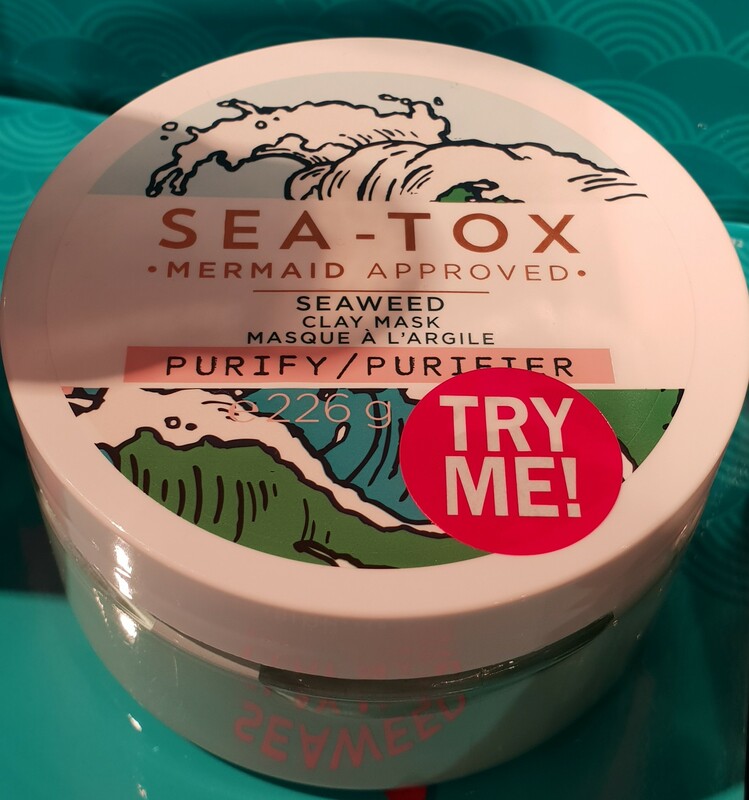 Purify your skin back to mermaid perfection with our Sea-Tox Seaweed Clay Mask! Infused with seaweed & minerals, this purifying all-over clay mask balances, detoxifies & refreshes your skin. Plus, it helps wash away dirt & impurities, leaving you with a body that’s always beach-ready! Directions: Prior to shower, apply a thin, even layer to face & body. Leave on for 5 minutes then rinse off with warm water. Mermaid Tip: Use as needed, giving more attention to oilier areas of the body! This stuff reminded me too much of the GlamGlow YouthMud (review here) which I didn’t exactly enjoy using. Also, I’m kinda’ over paste-like Masks that come in tubs (for the moment, at least). The fact that I have to wait (5 whole minutes! Oh noes!) before I can rinse it off, for some reason makes me even less interested in this product than I already am. Really not feeling this product, at all. That said, it would be fun to bust this out during “Girl’s Night In” and apply this stuff to your faces, before breaking out the Board Games (more on Board Games in an upcoming post) or vegging out in front of the tv or whatever. Personally, I prefer washing Masks like this off in the shower, as opposed to making a mess at the bathroom sink, so it’s a pass for me. Give your skin deep levels of nourishment with Sea-Tox Seaweed Body Lotion! Bursting with nutrient-dense seaweed, our fast-absorbing body lotion replenishes moisture & calms skin, leaving you feeling soft, smooth & nourished! Directions: Apply to body after showering & toweling off. Mermaid Tip: Use every day to help keep dry skin at bay! Confession time! 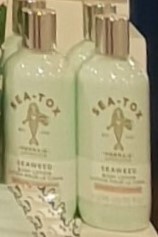 I kinda’ forgot to take a close-up shot of this Seaweed Body Lotion and the Sea Mineral Body Wash (below) so I just cropped them out of the first photo of this post. That’s why they’re so small and blurry (whoops)! I kinda’ wanted to purchase this stuff simply because I love all things Seaweed (as I’ve mentioned before on numerous occasions). However, since I was already getting the Seaweed Body Cream (in the faulty packaging, which meant I needed to finish it all up asap) in addition to several other Moisturizers from the Water Collection (here), I had to skip this thing. Deal or no deal, there was no way I was going to end up finishing any of the Moisturizers I’d purchased, if I got too many. That said, I totally would’ve purchased this Seaweed Body Lotion (soothing green tone and all), but despite its faulty packaging I just couldn’t resist the really cool Wave Print on the Seaweed Body Cream! So unfortunately, it was a pass for me on this stuff as well. Glow like a mermaid when you cleanse with Sea-Tox Sea Mineral Body Wash. Infused with skin-nourishing & conditioning sea minerals, our rich, bubbly lather leaves you clean & sea breeze soft. It’s a shore way to brighten your day! Directions: Thoroughly apply in shower then rinse off. Mermaid Tip: Use daily! 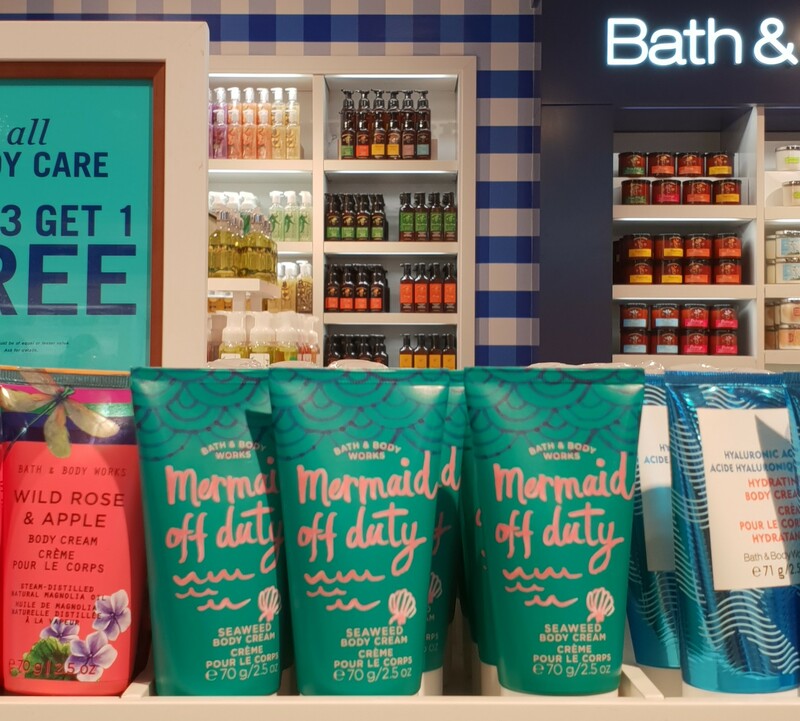 Real mermaids always have sea-clean skin. When it comes to Body Wash and Shower Gels, more is more! You can never have too many, I always say. Regardless of how orange it might look in the photo, the liquid is actually a light peach in real life. I liked the way this stuff smelled in-store, but when I used it during my shower, the scent was over-powered by the scents of all my other shower products. In fact, in comparison, the scent on this thing was barely discernible. I dunno’… sometimes it smells great and sometimes I can’t smell anything. I’m telling you, the Sea-Tox scent (see description at the beginning of the post for “fragrance notes”) is uplifting, but also very subtle. Quite frankly, overly sweet scents are starting to annoy me at the moment, so the scent on all the products in the Sea-Tox Collection was a very welcome change. That said, it’s not really a must-have. In fact, between the two, I’d totally recommend you go with the Water Collection Aqua Burst Body Wash (here) instead. I however am currently loving the Sea Mineral Body Wash purely based on the light and delicate, non-overwhelming scent! 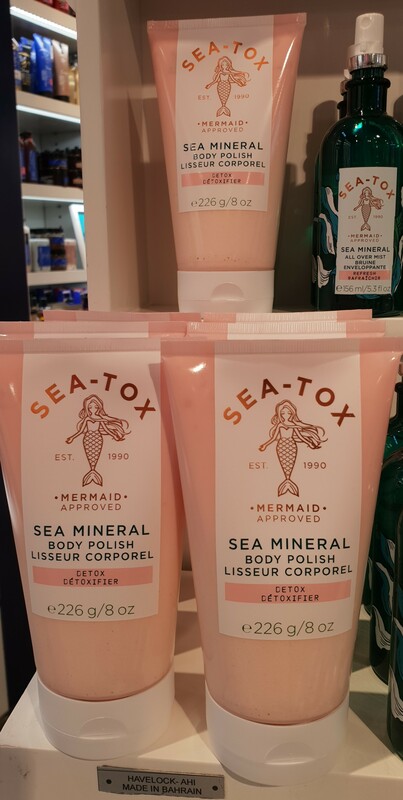 Get your skin beach-ready with our mermaid-approved Sea-Tox Sea Mineral Body Polish! This detoxifying clay body polish is awash with exfoliating sea minerals to nourish & condition skin, leaving it with a healthy looking glow from sea to shining sea. Directions: In shower, apply liberally all over skin then rinse. Mermaid Tip: Spread the love! Don?t forget your hands & elbows! I can’t resist a good Body Scrub or Body Polish (exfoliating gives me life! ), especially not one from Bath & Body Works. With use, I’ve come to discover that this Body Polish is exactly the same as the Jasmine & Green Apple Clay Body Scrub (previously hauled here). The only differences are that stuff was white and was scented, whereas this stuff is a white-based light pink and has no discernible scent to it. Otherwise, texture-wise and performance-wise, they’re effectively the same. I’ve been rationing the Jasmine & Green Apple Clay Body Scrub and trying to make it last, because I loved it and didn’t know how much of the stuff I had left. Thankfully, this version has transparent packaging so you can visually keep track (and now I can go ahead and finish up the previous one). It’s a bit drying if I’m being honest but so, so good at sloughing away dead skin leaving you with super-smooth skin! If you can only purchase a single item from the Sea-Tox Collection, make it this one! 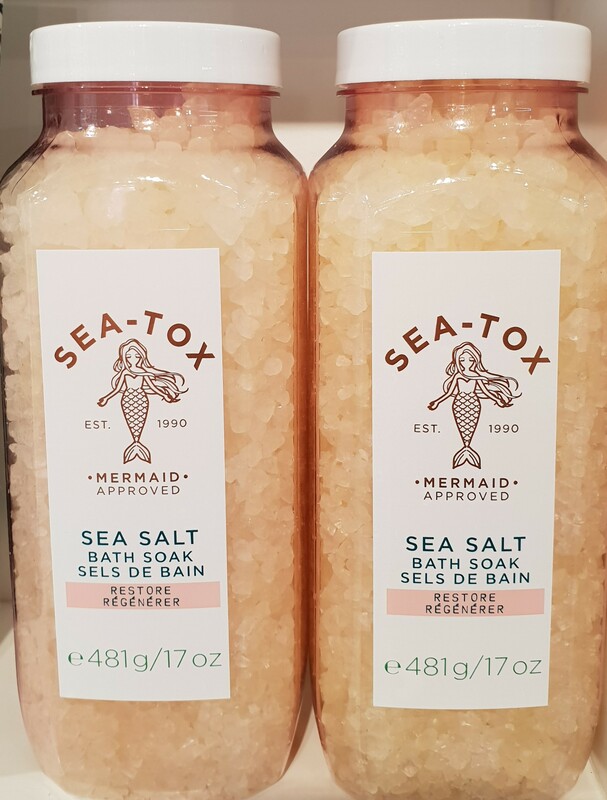 Turn your tub into a rejuvenating mermaid lagoon with our Sea-Tox Sea Salt Bath Soak! Made with soothing sea salt, these restorative bath salts help refresh & revitalize your skin while putting your mind at ease. Directions: Add 2 to 3 handfuls halfway through filling bath to desired level. Mermaid Tip: Thoroughly stir salts to release maximum fragrance with steam! Cuuute… as a gift for someone or as a decorative item for the bathroom! For me personally, I’m all set on Bath Salts (haulage here) at the moment. Also, I prefer showers to baths so… pass. Dive face first into a new skincare routine with our Sea-Tox Mer-mazing Face Sheet Mask! 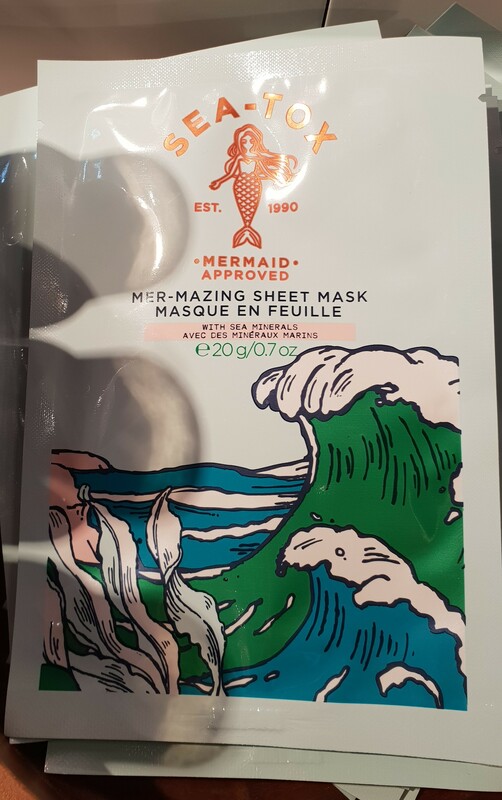 Packed with refreshing sea minerals, this sheet mask inspires tranquility & helps restore your skin’s vitality, setting your course for a glowing complexion! Directions: Apply mask to dry, clean face. Remove mask after 10 to 15 minutes. Mermaid Tip: Massage any excess product into skin! Sheet Masks! Yaaas, Bath & Body Works, Yaaaaaaas! Also, Wave Print <3 I picked up one of each from the Water Collection and Sea-Tox Collection. Can’t wait to try them out! I was already going to purchase the full size of this stuff (based on the pretty packaging), but this mini version was too cute to pass up (also based on the packaging but also the awesome formula)! This one is going to live in my handbag (for those times when I’ve forgotten to moisturize, but was already out of the house). I thought this was stupid cute, but refrained from getting it because I was going to get the full size instead (on account of the promo). Even in comparison to the other travel-size products, this thing was tiny (so cute)! This would make a perfect on-the-go pick-me-up, especially in Kuwait’s merciless heat! Achieve wavy, beach-perfect locks with Sea-Tox Mini Mermaid Sea Salt Hair Mist! Mineral-rich sea salt adds incredible texture & tousled waves, leaving hair feeling soft, never sticky or shiny for effortlessly windblown, mermaid-worthy hair. Not sure if this was available in a larger size or not, because I could only find the travel size version. As I said before, I’m obsessed with Sea Salt Sprays and it’s been a minute since my last one (H&M Sea Mist Salt Water Spray) so obviously I had to pick this up as well. Now that my hair is much shorter, I’m super excited to use this stuff!